For all the college seniors (and juniors too), this time of year involves a lot of decision making. We have to decide what we will do once we graduate from college. There are a lot of options out there, going to graduate school being one of them. I considered graduate school for awhile. After some time, I soon realized that I can’t afford to spend my money or time on something when I’m not eve sure if it is what I want to do. Graduate school is expensive, and I would rather take some time then return to school. That way, I will know exactly what my goals are for pursuing a graduate degree. Here are the main reasons why I am putting off graduate school, and what I will be doing instead. 1. Graduate School Costs Both Money and Time. Money and time that I don’t have right now. I would love to continue my education in some form, because I love learning, but I have to fit my education to my life now-not the other way around. I have spent the last 17 years of my life as a full time student. I have taken classes every semester (including summers) since 2011. That’s a long time, and I only wonder what I could do in the next 6 years with my career at the forefront. 2. I’m Ready for a Change. I went straight from kindergarten to college senior with minimal breaks. I’m happy to have earned a degree so quickly (and graduating at only 21 years old), but school is not the only thing out there. School is all I’ve ever known, and it’s scary to leave that. But, I have reached the point of being done. I’m ready to pack up my backpack and move to a purse or other work type bag. I’m excited to start making more than just some side cash. I can’t wait to have a nice income and to be able to live on my own and to make my own way. 3. I Have Multiple Interests. No I’m not complaining, but I don’t know what path is the best for me. I love writing, editing and proofreading. And I also love playing flute, teaching and arranging music. Those two main interests are by no means mutually exclusive, but I can’t exactly do both at a professional level. I certainly can’t pursue an advanced degree in both fields. Having multiple interests is great, and I plan on exploring my interests to see which field I should pursue long term and which would fit as a hobby. I’m definitely not ready to go to graduate school for anything. 4. Graduate School is a Big Commitment. Just like with a bachelors program, a graduate degree is a lot of work. It will take at least a couple years to complete, unless you can afford to go all in. I can’t afford to be a full time student. My parents were very generous in financially supporting me through my college experience, but I don’t want to put the burden of graduate school on to them-if they even want to help. Now that I have been through one college degree, it’s time to start supporting myself. Graduate school classes are a lot to handle. You have to do a lot of reading and writing, and maybe even some research. I could probably only take a class or two at a time. 5. I Don’t Need Graduate School. It sounds simple, but I don’t need to go to graduate school to do what I want to do. Both music and writing don’t require a degree. All I need is experience. It makes more sense to get that experience while working. I can even get paid that way. For some fields, a graduate degree is necessary. If that is the case for you, then go to graduate school. It will be worth it. For me, I can’t say for sure if a graduate degree will help me or not. I will be pursuing both music and writing. I hope to find some work as a writer or editor for blogs. In my free time, I will take flute lessons and work to keep improving my playing. I will be moving back home, and I am not ashamed of that. Since I don’t have a lot of money in savings, it makes the most sense for me to live rent free until I do have some savings. If you are graduating college and don’t have any concrete plans, that’s okay. Sometimes things work out for the better. There are many options out there for new grads. There is something for everyone. Grad school, a 9-5, or something completely different. 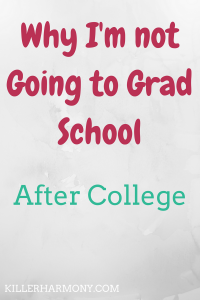 Have you thought about post grad life? What are your plans? Let me know in the comments or on Twitter (@HannahHaefele).